We are all data scientists these days, to one degree or another. The ability to explore and analyze data helps us make sense of our world. 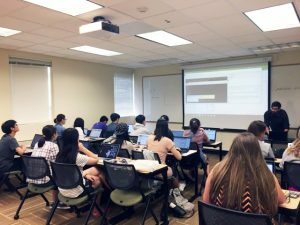 Duke’s Data Expeditions program aims to introduce more undergraduates to data science early in their college education. The Information Initiative at Duke (iiD), in partnership with the Social Science Research Institute (SSRI), supports pairs of graduate students to prepare a dataset for use in an existing undergraduate course. 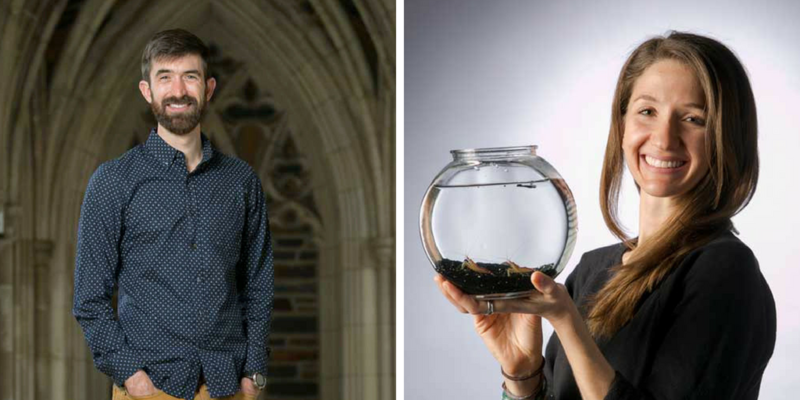 In one Data Expedition project, Exploring Cleaner Shrimp Color Vision Capabilities Using R, Biology doctoral students Eleanor Caves and Patrick Green teamed up with Professor Sönke Johnsen to pilot their approach in an introductory summer course called Sensory Systems. Green and his advisor Sheila Patek then adapted it for use in an upper-level lab course, Principles of Animal Physiology. Cleaner shrimp are crustaceans that provide handy cleaning services to reef fish by removing ectoparasites. 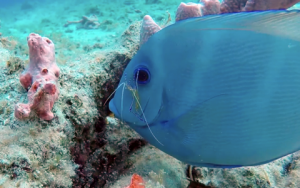 The project’s aim was to investigate how cleaner shrimp perceive the color patterns of other cleaner shrimp and fish. Caves collected the data as part of her doctoral dissertation. 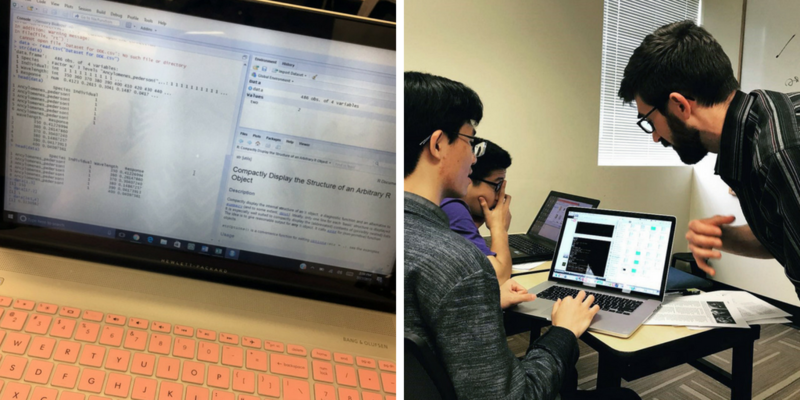 In the class, she and Green introduced the ecology of cleaner shrimp, asked the students to make predictions about color vision capability and taught coding sessions in R.
Along the way, both the undergraduates and the instructors faced challenges. 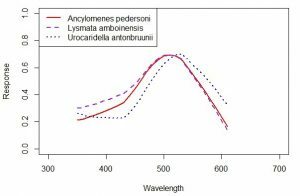 The students soon learned how to subset, index, plot, change the color and shape of data points, add best fit lines, change line width and type, and create smooth spectral sensitivity curves (which show how sensitive photoreceptors are across the visible spectrum of light). At the end, they created a figure of spectral sensitivity for several individuals of the same species. They compared their results to their predictions and discussed how they might use their new skills to analyze data they’ll collect in future lab-based courses. At the end of the day, coding gives students a deeper understanding of data to solve real-world problems. “It gives students, even those who won’t go on to do research of their own, a respect for the scientific process, how we analyze our data, and where results come from, so that hopefully they can be more informed citizens and interpreters of the overwhelming number of facts they’re exposed to every day,” said Caves. Both Caves and Green received the Dean’s Award for Excellence in Mentoring from The Graduate School. 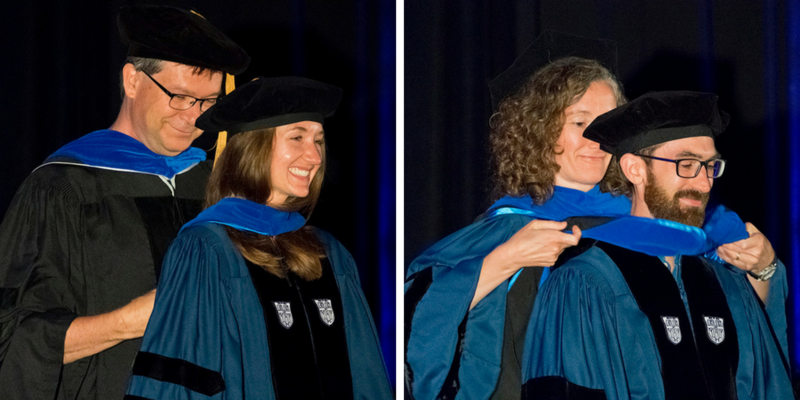 They graduated this spring and are now postdoctoral researchers in Duke’s Biology Department with the Nowicki Lab. See other Data Expeditions projects and learn about a new program at Duke called Archival Expeditions. Photos at top and bottom courtesy of The Graduate School; other photos courtesy of Eleanor Caves and Patrick Green.